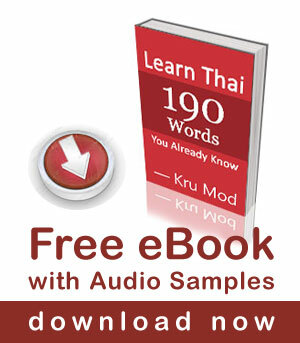 VIDEO: How Good Are Your Listening Skills in Thai? I asked my friends and people in my neighbourhood the same question "อยากได้อะไรเป็นของขวัญปีใหม่ /yàak dâai à-rai bpen kăwng-kwăn bpii-mài/ What would you like to have for New Year gift?". They give different answers which offer you interesting new vocabulary. Also they speak in normal speed which is a good listening practice for you. I would like you to just listen to what … [Read more...] about VIDEO: How Good Are Your Listening Skills in Thai?